Mirabai Nagle, a 2017 candidate for Boulder City Council, is a Boulder native and small business owner who decided to run as a result of noticing the town she grew up in was changing—and perhaps not for the better. While Boulder was once known for slow growth, Nagle witnessed new large developments popping up in town, with local small businesses increasingly unable to afford rents, and realized it was time to take action if she wanted the city’s character to retain the qualities she has come to know and love. Professionally, Nagle is a gemologist, and she runs a branch of her family jewelry business called Engaging Diamonds. In short, she buys diamonds or colored stones to create custom jewelry pieces for her customers, or fit the gems into prefabricated settings. She earned her graduate gemology degree from the Gemological Institute of America in San Diego, and worked in a fine jewelry shop in San Diego while working on her degree. There, she developed business management expertise along with honing her customer service skills. Nagle earned her Bachelor of Science degree in Business Administration from the University of Colorado Leeds School of Business, which helped her land a position in the corporate office of Crocs as an assistant to its CFO and several other executives. While with Crocs, she was able to work with its marketing, finance, accounting and public relations departments—and believes this multidimensional experience within a large corporation formed a valuable attribute that would serve her well as a Council member. “There are so many different issues on Council, and so many different perspectives and ways of doing things. Actually doing that (with Crocs) helped me understand how different parts of the company operated, but also how it came together as a whole to be a company,” said Nagle. She has also been a volunteer firefighter with the Sugar Loaf Fire Protection District (SLFPD) since 2012. 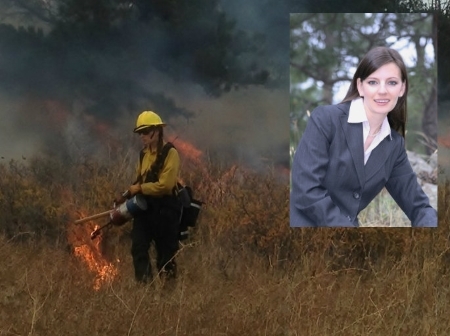 During her time with SLFPD, she worked in the high winds and rugged terrain of the land west of the City of Boulder, including during the 2016 Cold Springs Fire near Nederland. Due to a lack of communications, she had slurry mixture dropped on her from above within several minutes of arriving on the Cold Springs scene—again, a learning experience regarding the importance of communications—yet a valuable overall experience in leadership and the value of public service. “We did save a lot of homes—I think about eight structures went up, but there were hundreds in the way. Just seeing what we did for people, and how grateful they were was very humbling,” said Nagle. Nagle has been politically involved for a number of years, including taking political science courses at CU, volunteering with local political organizations in Boulder and San Diego, and taking class trips to Washington, D.C., where she met then Sen. Ben Nighthorse Campbell and then-Rep. Mark Udall. After coming back to Boulder from San Diego, she started noticing more development and taller buildings defining the local landscape, in some cases blocking views of Boulder’s foothills, and started reading more local news and attending local political events. She followed the 2015 election and attended a candidate forum in Gunbarrel, and believes in retrospect that certain candidates got elected espousing platforms that did not reflect their eventual behavior in office. Nagle started on her path to homeownership through the city’s affordable housing program, and said renting her affordable home in north Boulder allowed her to save money for a down payment on her current Gunbarrel home. According to Nagle, Gunbarrel is a unique part of Boulder, since part of it is within city limits while other parts are just outside of the city’s boundaries. She said a switch from the Boulder Valley Comprehensive Plan’s “four-body review” system for deciding certain land-use designation changes to three-body review could create imbalance for decisions concerning Gunbarrel, since the city would have 16 total representatives (Council and Planning Board) while the county portion would only have three (County Commissioners). “Gunbarrel residents who are county residents use Boulder—that is their city. It’s where they go shopping for the most part, and so not to have representation, and not to have someone who cares about the interests of what’s happening in Gunbarrel seems sort of unfair. A lot of residents feel very frustrated because they feel they’re in a position of just having to accept whatever Boulder sends their way in terms of development,” said Nagle. She also called out the lack of affordable housing in certain Gunbarrel apartment complexes, noting that building 20 percent affordable housing on site would have been of great benefit to Gunbarrel by creating a more inclusive community with more people of different socioeconomic levels. Nagle remains in favor of continuing to explore forming a Boulder municipal electric utility, even after the recent ruling from the Colorado Public Utilities Commission (PUC) regarding Boulder’s application that caused several other 2017 candidates to change their tune. She said “off-ramps” still exist that the city can take in case municipalization proves not to be the best option, and that cost-effectiveness is a critical factor, yet the municipal utility would be a vitally important tool if the city is to reach its goal of 100% renewable electricity by 2030. “Currently, Xcel is taking $35 million (profit) out of Boulder. That’s a lot of money that could be staying in this town, not to mention the fact that we’d be tied to coal with them, and that increases greenhouse gas emissions,” said Nagle. As a small business owner, Nagle is concerned that local small business owners may be unable to keep up with bottom-line factors, especially the increasing price of rent. For example, Perry’s Shoe Shop recently announced it would be forced to leave Boulder after decades of doing business here, because of a steep rent hike. Nagle noted that small local businesses make a community unique, as opposed to areas full of the same chain stores that one can find in so many American cities. In a twist on the city’s current Landmarks program for historic structures, she suggested that Boulder could keep more locally owned companies by landmarking the actual business, and offering tax breaks to property owners in exchange for providing long-term affordable rent. Should she be elected, Nagle believes she would offer the citizens of Boulder a strong combination of characteristics—a small business owner, a volunteer firefighter, a millennial concerned about Boulder’s growth, and a young homeowner. With concern that the city’s Public Participation Working Group process revealed that many Boulderites don’t feel like their voices are being heard, Nagle said she’s ready to listen to the people and the experts to craft policy that brings back trust in government that some may have lost. “I think I have a unique synthesis of perspectives on many of the issues, and I can help overlap and gap some of the bridges amongst the opposing views within our community, and hopefully help bring it together,” said Nagle. Nagle is one of the five candidates endorsed by PLAN-Boulder County and Together4Boulder. She also lists endorsements from Southeast Boulder Neighborhood Association, Table Mesa Neighborhood Association, Greater Gunbarrel, and Gunbarrel Veterinary Hospital. Nagle has received maximum $100 donations from local notables such as current Council members Lisa Morzel and Sam Weaver, Council candidate John Gerstle, former Council members Allyn Feinberg and Steve Pomerance, and others.